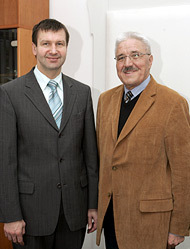 The popular mayor of the community Rogaška Slatina mag.Branko Kidrič finished the secondary technical school in Celje. He studied building industry at the Universities of Maribor and Zagreb. In the year 2006 he was – for the fourth time- elected for the mayor. The community is a member of the Alps-Adriatic Centre for Cross-border Co-operation (AACC) in Klagenfurt. Last week, on a working visit, the Secretary-General mag.Filip Warasch discussed with him the possibilities for the future cooperation, too. Where does Rogaška Slatina lie and what are the economic parameters of the community? The community Rogaška Slatina has 11.000 inhabitants, the town itself 5.000. Rogaška lies south-east from Celje, on the border to the Republic of Croatia. The main economic branches are glass industry, tourism, building industry and trade. The biggest company is The Rogaška glass factory, where about 900 people are employed, out of them 500 from our community. In the community we also have the biggest producer of organs in Europe, The organs-building workshop of Anton Skrabl, which has already made more than 200 organs for all the continents of the world and employs 55 persons. Also the cosmetic company Afrodita is very successful, it employs 135 persons and sells its products in Europe and Asia. Altogether we have about 4.600 working places in the community. The arranging of the tourist centre in the community however demands significant costs. For the current maintenance of the Thermal park we are spending yearly around 100.000 Eur, what is quite a lot. Last year the community Rogaška Slatina participated at the international competition “Entente florale Europe 2008” and out of 12 countries it won the silver medal. Thermal and medical tourism are very significant for your community. From where do the guests come and how is the development of this branch proceeding? In total we have 1.500 beds in six different hotels, three of the hotels are in reconstruction now. 550 persons are employed in thermal tourism. In the mid-term we are planning to build three underground garages, with parks on the ground surfaces. With the garages we will also solve the parking problems of the hotels , which do not have enough parking places available. One garage will be built by the community, especially for the needs of the complex, which is intended to offer medical services- a kind of diagnostic centre, for domestic patients and for patients from our neighbourhood. What are your wishes and expectations regarding the cooperation with the Alps-Adriatic Centre for Cross-border Co-operation? We are satisfied that we started our cooperation several years ago. Some mutual activities have already taken place. There was-however- not a lot of cooperation in the last period, because our country does not establish the necessary conditions to strengthen this cooperation on the local level, what means, the public competitions which demand cross border cooperation would be announced . In positive case we have several projects ready and with the support of AACC I believe to find relevant partners in Austria and also to implement successfully one or two of such projects with them.